In our study, we evaluated the threshold number of EUS examinations for gastric cancer T staging using cumulative sum analysis (CUSUM). The American Society for Gastrointestinal Endoscopy (ASGE) suggests minimum numbers of EUS procedures according to lesion site. In cases of mucosal tumors, including esophageal cancer, gastric cancer, and rectal cancer, the suggested threshold number of procedures is 75. This number, however, was determined based on the 2 studies on the learning curve for staging esophageal cancer rather than gastric cancer. Figure 2. 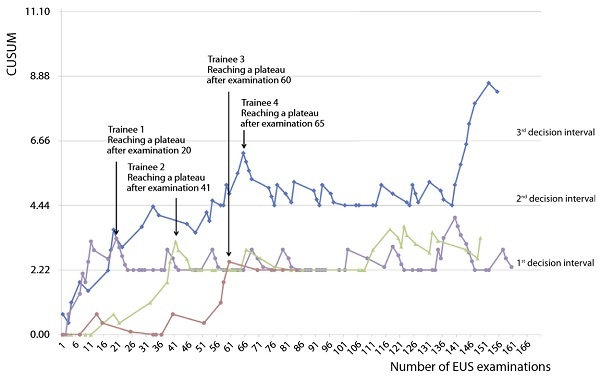 Upward CUSUM plots of 4 EUS trainees. CUSUM, cumulative sum. The CUSUM scores of all of 4 trainees in the study reached a plateau within the 65th examination. A threshold number of 75, as suggested by ASGE guidelines, may be reasonable for achieving competency in gastric cancer T staging by EUS. However, the deterioration of performance after achieving competency can be observed. 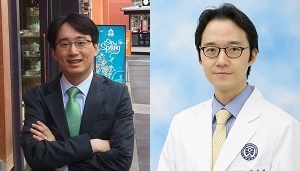 In our study, performance of one trainee deteriorated at examination 145. If the deterioration of performance is detected during CUSUM monitoring, re-education can be provided; then, it will help to prevent further deterioration. Find the abstract for this article online.